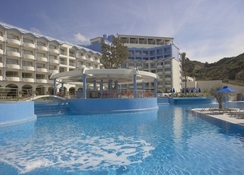 Atrium Platinum Resort Hotel and Spa is a premium 5-star hotel in Ixia, Greece. 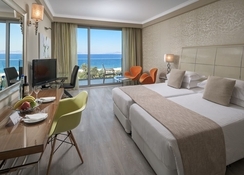 The luxury family hotel is set against the beautiful and pristine cove of Ixia Bay. The hotel has both indoor and outdoor pools with spa facilities offering the guests a luxurious, and relaxing vacation. The property is closely located to the Ixia public beach, making it an ideal location for vacationers looking for a sunny holiday. The rooms at the hotel are designed and decorated to provide the guests a sophisticated, lavish and high-standard stay. All the rooms come with sea view and some rooms also come with a private pool. The hotel houses several restaurants and bars on its premises, which provide both al carte and buffet options. 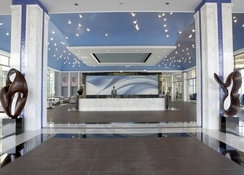 The Atrium Platinum Resort Hotel and Spa is located 11.6km away from the Rhodes International Airport. The closest beach is just 100m away from the hotel. Apart from that, the Elli Beach, is 5.5km away from the hotel. 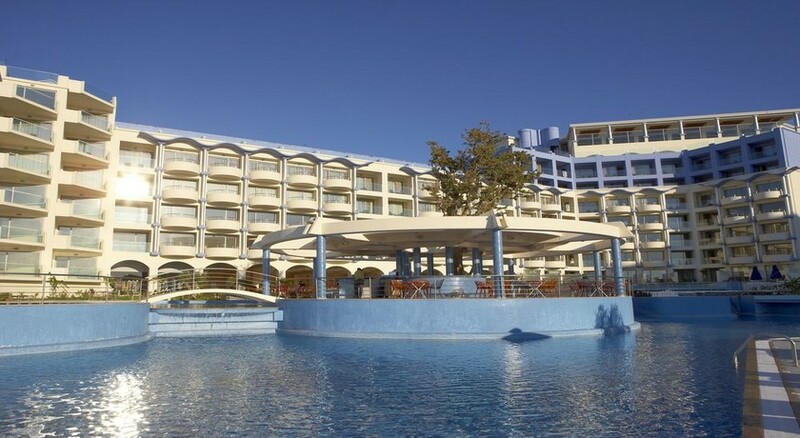 Tourist attractions like the Acropolis of Rhodes, Rodini Park, Temple of Apollon, University of Aegean, Andreas Papandreou Park, Park of Saint Fragkiskos, Rhodes Beach, Diagoras Stadium, Yeni Hammam, Clock Tower are about 3km away from the hotel. Also, Grand Master's Palace, The Street of Knights, Archaeological Museum of Rhodes, Synagogue Kahal Shalom, Santa Maria della Vittoria, Mandraki Port, Evangelismou Church, Deer Statues and Aquarium of Rhodos are also within the distance of 3-4km away from the hotel. The Atrium Platinum Resort Hotel and Spa has 13 different types of room and suites depending on the amenities and the number of occupants. Guests can choose from Deluxe Rooms Side Sea View, Deluxe Rooms Sea View, Deluxe Rooms Sea View with Shared Pool, Deluxe Rooms Sea View with Personal Pool, Executive Deluxe Room Side Sea View, Deluxe Junior Suite Sea View, Deluxe Junior Suite Side Sea View with Personal Pool, Superior Suite Sea View, Superior Family Suite Sea View, Executive Suite Sea View, Executive Family Suite Sea View with Personal Pool, Ambassador Suite Sea View with Personal Pool and the Presidential Suite Sea View with Personal Pool are the type of rooms offered at the hotel. The rooms are equipped with facilities like a flat-screen 32’ satellite TV, individually-controlled A/C, Wi-Fi internet access, direct dial telephone, electronic safe, espresso machine, tea and coffee making facilities, mini bar and more. The bathrooms are equipped with two sinks and mirrors, Jacuzzi bathtub, bathrobe, slippers, hairdryer, cosmetic mirror, shaving adaptor and luxury branded toiletries. The hotel provides 24-hours room service. The Atrium Platinum Resort Hotel and Spa houses four restaurants and two bars on its premises which offer a variety of local and international cuisines. The Archipelagos Main Restaurant, Porfyra, Koi and Elia & Tramonto are the onsite restaurants that offer cuisines like Asian, Mediterranean, continental and Greek. The guests are also offered a grand breakfast buffet. The Chromata Bar and Rotonda Pool Bar offer a variety of wines and cocktails to the guests. The proximity of the hotel to the city centre also allows the guests to try the local cuisine at a number of restaurants nearby. The Atrium Platinum Resort Hotel and Spa offers an extensive range of indoor and outdoor activities for both children and adults, making it an ideal destination for family vacations. There are preheated indoor and outdoor pools. The hotel also offers exhilarating sports and water sports adventures including tennis, kiteboard and surfing on the Ixia Bay. The guest can enjoy sports like table tennis, billiards, squash, darts, among others. Vacationers looking for a sunny, relaxed vacation can visit the closest public beach which is across the hotel and indulge in water sports and sunbathing. The hotel also houses a luxury spa and wellness centre where the guests can enjoy a number of treatments and massages. Lovely staff, lovely food, amazing decor. Would highly recommend!